Claude Monet is arguably one of the world’s most famous artists, with artworks that hold appeal for art lovers across the generations. Monet’s Garden – A Book for Kids introduces the work of Claude Monet to children, sharing information about the artist’s life, inspirations, art, family and career. I confess the book had my attention from the very first page with the gorgeous endpapers showing a photograph of Claude Monet’s house and garden in Giverny, France. The book is also liberally illustrated with reproductions of Monet’s work in addition to photographs and other illustrations relating to his life. To help younger readers engage with Monet’s story, the book has a guide, Pierre the wren, who appears throughout the book with additional information, explanations and encouragement for children to try different art and craft activities (step-by-step instructions provided). Monet’s Garden – A Book for Kids encourages children to enjoy Monet’s work and to think about the things that inspired him to create his masterpieces. The book is easy to dip in and out of, with colourful fonts, snippets of information, activities, quizzes, general trivia and a range of interesting facts about the artist’s life. Alternatively, children can simply look through the pages to be inspired by Monet’s artworks. My daughter has always found books about artists and their artworks fascinating and I know many children who enjoy simply looking through books about art. Monet’s Garden – A Book for Kids is just the right blend of information, artworks and encouragement to explore creative ideas and it is sure to appeal to young children with an interest in drawing and painting. Monet’s Garden – A Book for Kids would also be a fantastic resource for primary school classrooms for children to browse through for inspiration as well as information. The National Gallery of Victoria is hosting an exhibition of Claude Monet’s works, Monet’s Garden, from 10 May – 8 September 2013. 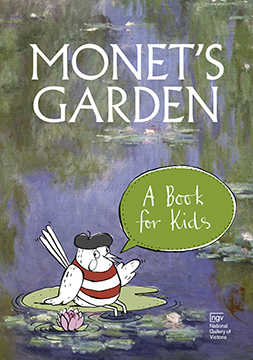 Monet’s Garden – A Book for Kids is available at the NGV bookshop in conjunction with the exhibition.